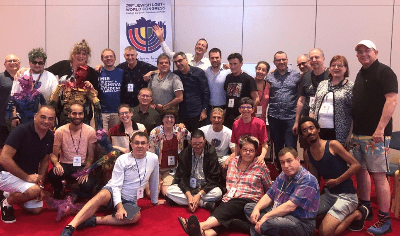 Delegates from across the globe attended the 25th World Congress Jewish LGBT+ Conference held in Sydney. Several events lead up to the conference held at Kehillat Masada, Sydney Jewish Museum, Emanuel Synagogue and Mardi Gras. The conference held its Purim Shpiel producing its version of Fiddler on the Roof entitled Feigele on the Roof. 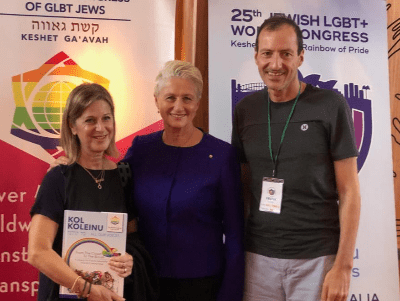 Keynote speakers were Prof Kerryn Phelps MP and Abby Stein who brought a depth of information and insight to issues that matter within the Jewish LGBTI+ dialogue. Melbourne-based, Prof Paula Gerber provided a stunning overview of LGBTI+ Human Rights issues across the globe, and International presenter on BDS, Anti-Israel/Antisemitism with Assaf Weiss from Israel also illuminating on this complex subject. Workshops led by Robert Griew & Tony Fiddes as well as Myrna Lewis brought a depth of feeling and insight to the conference. The Kabbalat Shabbat service at the Emanuel Synagogue was well-attended providing a moving and inspiring introduction to Shabbat, followed by a dinner supported by NSW Jewish Board of Deputies attended by 100 guests, including Vic Alhadeff ( CEO) as well as out-and-proud political leaders;Peter Cavanagh, Mayor of Woollahra and Trent Zimmerman, Member for North Sydney. It was also very meaningful to hear from Nurul Tajularus, Chair of Sydney Queer Muslims and to share a minutes silence in memory of the Christchurch tragedy. Visitors came from across the world including Israel, USA, Argentina, Britain, Singapore, New Zealand and France. This was the first time the conference has been held in Sydney and was supported by the Emanuel Synagogue, NSW Jewish Board of Deputies, Shalom College, Geoff Sirmai Arts Publicity and Yalla Foods and a range of personal donors. An excellent conference. Kudos to Kim Gotlieb and his team, together with the World Congress team and of course Emanuel Synagogue for their fantastic venue.